Where Did The Leonardo Come From? 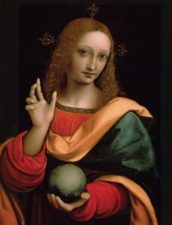 The Art Newspaper reports: ‘Fresh doubts are emerging over the English royal provenance of Leonardo da Vinci’s Salvator Mundi (dated around 1500), which was bought a year ago for Abu Dhabi. New evidence has revealed that another painting of the same subject, now in Moscow’s Pushkin State Museum of Fine Arts, is more likely to be the one recorded in the historic inventories.’ Hmm.